I realized I hadn't told the whole story of Moira coming into the world. On October 31st, at 1:30 in the morning, Kath’s water ruptured. It’s not like in the movies where there is this ‘gush.’ For Kath, it was more like a slow leak. Kath thought that the baby was kicking her bladder or something, so didn’t worry about it. Scott went on to Charles City (an hour away) and Kath went in to work. After another accident, Kath returned home, changed, and then called her work, telling them that she’s going to go see her doctor, and that she’ll ‘see them later in the day.’ Kath called Scott and let him know that she was going to the clinic. Dr. Swanson saw Kath, and, in a very laid back fashion, said ‘Why don’t you go on to the hospital. I’ll let them know you’re coming.’ Kath was very much in work mode. She didn’t put the pieces together. She called Scott and tells him she’s going to the hospital. Scott was concerned, but she thought that they would just put her on bedrest or something like that. Once at the hospital, she found out that Dr. Swanson wanted to admit her since she is in labor. She called Scott back and told him they admitted her and she’s in labor. Scott left Charles City, called his mom to keep him from going 75 mph on the way home, talked to her the whole way, and got back to Decorah at about 12:30pm. The first thing Kath told him when she saw was “This is not how I was planning to spend my day.” She said that many times that day. Severe labor pains start at 2:30pm, and Kath is drugged. Both she and Scott sleep in between contractions. The drugs where off at 5:30pm, and she gets drugged again. Scott forgets that he needs to eat, being diabetic and everything, and their friend Rick Scheffert brings him a sandwich so he can continue functioning. Moira Maeve Zierath was born on October 31st, 2007 at 9:10pm. Our Halloween baby. This was her trick and our treat. 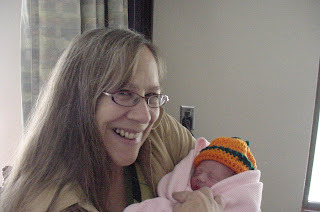 Moira was 5lbs8oz and 20 inches long. 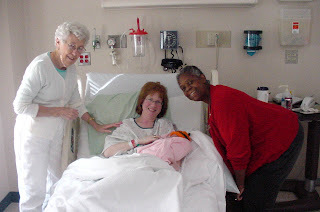 Her first visitors, Dag and Sharon Rossman, came when she was twelve hours old, and her godmother Sheryl Scheffert got to hold her around 10:30am the next morning. Scott’s co-workers Phyllis and Colletta were next to come in, and Kath’s co-workers were in after work. Rick Scheffert, the godfather, got to hold her that night. We firmly believe that it takes a village to raise a child, and we are gathering our village. Since Moira was a month early, the house, including the nursery, were not quite ready. Scott gathered an eight person work crew on November 3rd and they proceeded to lay laminate flooring in three rooms, tear up carpet in one, build a linen closet in the bathroom, and get the nursery more or less ready. 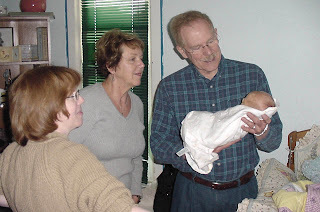 Since then, we’ve had Grandpa Zierath and MJ come and visit, and Aunt Tanya and Uncle Marius came for Thanksgiving. A couple of Scott’s former co-workers also came and visited, and Moira got her first tour of Luther on November 26th. Grandma and Grandpa Ipsen got to meeter the following Friday night. At Christmas time, Moira gets to meet the Platteville families (my brother and his crew, the Kilians, and the Wang clan). We get to go to Madison to see Grandpa Z, MJ, Tanyadee, Marius, Maz, Great Brettan, Andrea, and BZ on my side, and then Kath's brothers and sisters-in-law and nieces. We'll get to LaCrosse the following weekend again to see the last brother and then Kath's adult niece (who has her own little boy now). Kath started back at work this week. That separation is very tough on all of us, and then Moira thinks that night is a great time to be awake. But we are very, very happy!! Life is good! So when is the trip south? 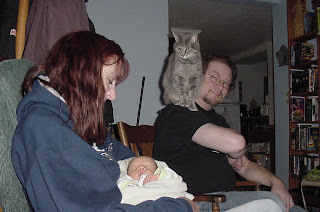 I love the last picture with the cat looking down at little Moira. I hope you can make a trip North at some point too. I don't know when we're traveling. Maybe March, April, or May. Or early May. It's hard to figure it out. I know we'll be traveling. Kaths email got bounced back . .
Warmest wishes for a happy holiday season and a joyous new year. ..
drop a line sometime and let's get caught up. . .